Eclogite is a metamorphic rock that includes garnet crystals nestled in a bed of gray-green omphacite. 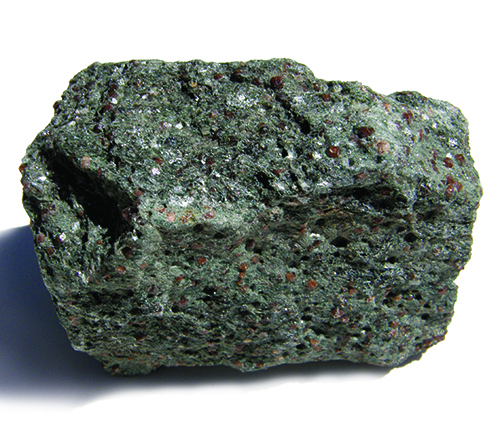 Eclogite is a metamorphic rock. That is, it originally started as something else and was transformed by heat and pressure. In the case of eclogite, the rock originally started as mafic basalt or gabbro (igneous rocks relatively low in silica) that formed as seafloor welling out from the spreading center of a fissure in an oceanic plate. Due to plate tectonics, that seafloor subsequently was subducted (drawn under) at the edge of a continent. The heat and high pressure of such a subduction zone resulted in high-pressure metamorphism that changed the original basalt into eclogite. Eclogite is a so-called “mineral assemblage.” It consists of a number of different minerals that have grown together. Such minerals might include red pyrope or almandine garnet, green omphacite (clinopyroxene), kyanite, quartz, rutile, phengite, and more—including even diamonds. 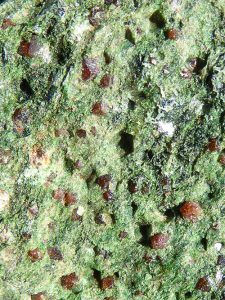 The photos accompanying this article clearly show garnet crystals on a gray-green groundmass of omphacite. The combination of red, green, and white minerals have resulted in eclogite sometimes being called “Christmas rock”. Thus, when it rises to the surface, it gives us clues as to conditions in this crucial juncture of the varied zones of our Earth’s interior. Deposits providing us with such clues have been found around the world. Significant deposits include Greenland, Scotland, France, Italy, Bavaria, Norway, Brazil, central Australia, Newfoundland, and the Coast Ranges of California in the United States.